I travelled to Yangon, Myanmar recently and I was amazed by the sights there. I would like to share with you some interesting observations and tips for first-time business travellers. 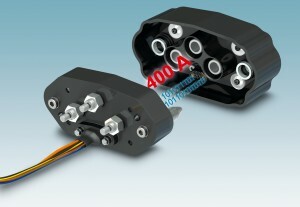 Phoenix Contact offers high-performance connectors to charge large DC battery units. The DC interchangeable battery concept for power applications was specifically developed for electric commercial vehicles. It is used in city and community transportation systems, for transport vehicles in the logistics environment, as well as for people movers. As a result of its dimensions and material properties, the connector system is designed for currents up to 400 A, voltages up to 750 V, and 10,000 insertion and withdrawal cycles. As well as providing specific charge management, the integrated data module monitors the temperature in order to avoid overheating. The spring-damped guide bolts compensate for any tolerance when inserting the connector and dampen any vibration when the vehicle moves. In addition, they ensure reliable connectivity and a long service life. With this new product, Phoenix Contact has further rounded off its product line for e-mobility solutions. The new Bluemark Cled from Phoenix Contact makes labeling standard UniCard materials for marking terminals, conductors, and devices as easy as printing on paper. With its PLA 5 and PLH 5 PC terminal blocks, Phoenix Contact expands its series of conductor connections for high-current applications that do not require any tools. In the scope of a long-term technological collaboration, Phoenix Contact, manufacturer of industrial electronics, and Gossen Metrawatt, manufacturer of measuring and testing technology, have jointly developed a product for acquiring energy data. The objective of energy data acquisition is to identify potential for increasing efficiency and therefore helping to calculate costs. Guess the Winner of Euro 2012 contest……..Winner revealed! During the Innovation Fair held on 22nd of June, customers will surely have noticed or even have been approached by ladies walking around with an iPad inviting you to take a survey. At the end of the survey, customers were given the opportunity to guess the winner of Euro 2012 and stood a chance to win an iPod Nano! The winner has been picked… see who is it after the jump! One of the attractions during the Innovation Fair 2012 was the opportunity for the customers to guess the number of soccer balls in a display panel. We had an overwhelming amount of participants, but after filtering through we have got the winner! Find out who is he after the jump!